Searching for the right distortion pedal to add a little extra crunch to your sound? We’ve got you covered. 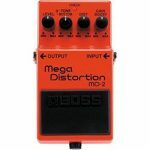 Whether you play blues, rock or metal, a great distortion pedal is an essential addition to any serious guitarist’s pedalboard. From affordable options to iconic pedals and high-end gear, we’ve put together a list of the 20 best distortion pedals on the market for guitarists. Each of our recommendations includes information on the pedal’s strengths, weaknesses and unique features. We’ve also included links to each distortion pedal on Amazon, making it easy for you to add new gear to your studio or live performance kit. Affordable and versatile, the Behringer OD300 Overdrive/Distortion pedal is a great option for beginners. The OD300 has dedicated level, tone and drive controls, letting you tweak the amount of gain effortlessly. There’s also a mode control, letting you switch from a classic overdrive sound to a crunchier, heavier distortion effect. Behringer have made some small sacrifices to get the OD300 to its affordable price, but none are deal breakers. The most noticeable sacrifice is the pedal’s construction — unlike the more expensive distortion pedals, the OD300 is made of plastic rather than metal. 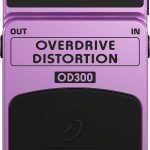 Despite this, the OD300 is a solid, durable and effective pedal that does what it’s supposed to do, all at an affordable price. Arguably the best overdrive/distortion pedal available for beginner players looking to expand their pedalboards. 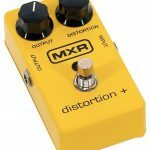 Priced under $100 and built to tolerate serious abuse, the MXR M104 is a great distortion pedal for gigs. This bright yellow pedal only has two controls — output and distortion — making it easy to adjust to your needs without ever feeling too complicated. 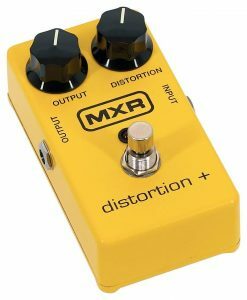 The MXR M104 puts out a classic late 70s/early 80s distortion tone, making it a great option for classic metal guitarists. If you’re looking for an Randy Rhoads tone, Judas Priest or Iron Maiden-style sound, you’ll find a lot to love here. The only real weakness of the M104 is its lack of versatility. While this pedal works great as part of a hard rock or classic metal pedalboard, it’s a little too powerful for classic rock while not quite powerful enough for serious thrash or death metal. Overall, the MXR M104 is a great pedal that’s sure to satisfy any classic metal guitarist. If you’re aiming for a classic early 80s guitar tone that’s perfect for riffs and solos alike, you’ll find a lot to enjoy with the MXR M104. The MXR M75, or “Super Badass” as it calls itself, is one of the best sub-$100 distortion pedals on the market for hard rock guitarists. With separate output, bass, mid, treble and distortion controls, the M75 gives you a huge level of control over your sound. Add sturdy construction into the equation (the M75 is made entirely of metal) and this pedal is a great option for rehearsals, gigs and the studio alike. From a tone perspective, the M75 Super Badass is best suited for classic rock, hard rock and some metal. 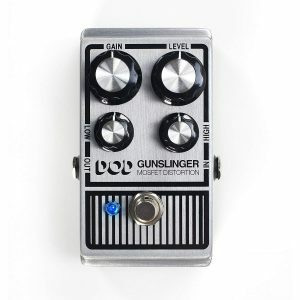 While it doesn’t match the M104 (or better yet, the M116) for heavy distortion, it’s still a great high gain pedal that works well for both soloing and rhythm guitar. If you’re looking for a versatile distortion pedal that can handle everything from classic rock to 70s metal, you’ll like the M75 Super Badass. Better yet, pair it with your favourite wah pedal for an unbeatable solo tone that’s sure to catch the audience’s attention. 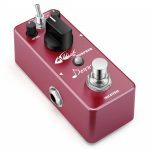 Warm, durable and affordable, the Digitech DOD is one of the best budget hard rock and heavy metal distortion pedals on the market. 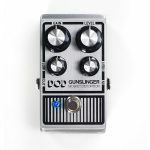 The Gunslinger Mosfet packs a ton of features into its price. These include gain, low and high controls, as well as a separate level control. There’s a blue status LED to show what the pedal’s doing at any time, a beefy switch control and even a brushed metal finish. From a tone perspective, the DOD is ideal for hard rock and some metal. While it isn’t quite crunchy enough for serious thrash or death metal, it’ll work well for most modern metal without ever sounding overly muddy or undefined. In short, this pedal packs in features that you’d normally find on products twice its price. Add smooth, crunchy and impressive distortion into the equation and it’s tough not to recommend this for beginner or budget-conscious guitarists. It’s pure black, durable and affordable. With a classic 70s/early 80s distortion sound, the TC Electronic Dark Matter distortion pedal packs a lot of punch and numerous great features into one of the best retail prices for any distortion pedal on the market. 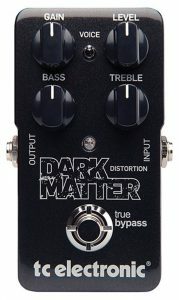 On the front of the Dark Matter, you’ll find separate controls for gain, bass, treble and overall levels. The gain control is very smooth, with the distortion starting from smooth fuzziness and working its way up to a crunchy, gain-heavy 70s/80s hard rock sound. While the Dark Matter won’t quite be enough to handle classic 80s thrash metal, it’s more than powerful enough for most hard rock and blues. Crank the gain up all the way and it’s also strong enough to produce a good New Wave of British Heavy Metal sound. If you’re looking for a super-heavy pedal for thrash, speed metal and more, you’ll probably want to skip this one. 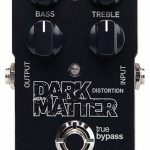 However, if you want something versatile and affordable that covers everything from blues to hard rock, the TC Electronic Dark Matter Distortion will definitely suit you. 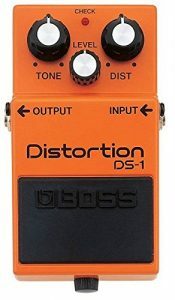 The DS-1 is one of the most versatile distortion pedals on the market. 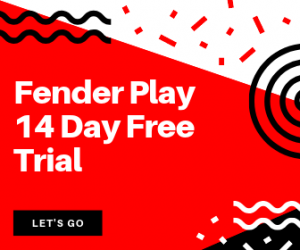 Although it’s designed for rock, it’ll handle everything from blues to metal fairly easily once you master the three distortion, tone and level controls on the front. Of these three controls, it’s the distortion that will get the most use. Turn it to the left and you’ll get a light, fuzzy sound that’s perfect for everything from blues to classic and hard rock. Turn it to the right and you’ll go from 70s metal all the way to a crunchy, late 80s thrash metal tone. Like the Dark Matter and Super Badass, the DS-1 is priced affordably. It’s also very well made, with a classic design, metal construction and a build quality that’s second to none. 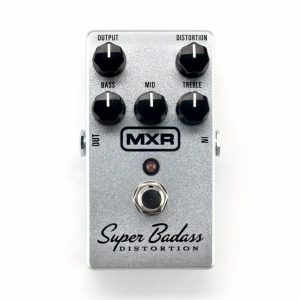 In short, this is the distortion pedal you’re looking for if you want versatility, reliability and value for money. 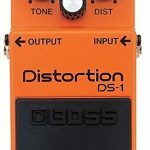 And, in the name of a classic sound and complete versatility, the DS-1 comes in at our top rated distortion pedal within this guide. 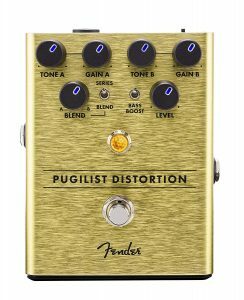 With its gold finish and huge range of control options, the Fender Pugilist is a premium distortion pedal that’s perfect for rock guitarists. Before we get into the tone of the Pugilist, let’s cover its features. The Pugilist has two separate gain engines, letting you set up “A” and “B” tones, then switch between them with the press of a switch. This makes it a great option for gigging and rehearsals. 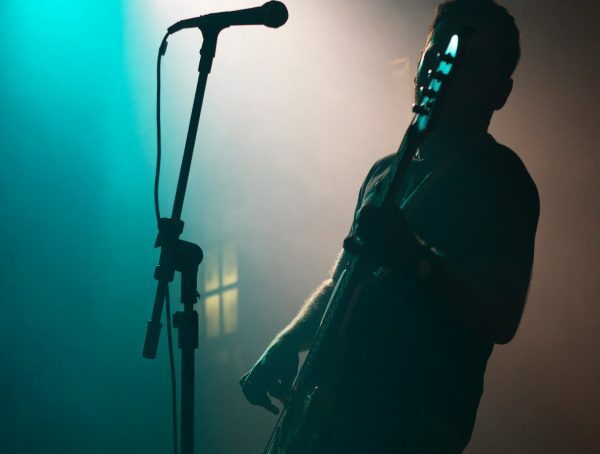 Switching from a rhythm tone to a solo tone is as simple as stepping on the switch. From a tone perspective, the two channels include the usual gain controls, as well as tone controls and an optional bass boost. 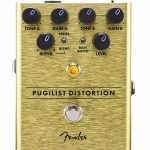 While the Pugilist isn’t a heavy metal distortion pedal, it’s more than powerful enough to handle classic rock, hard rock and some 70s and 80s metal. Turn the gain down and it also doubles as a good distortion pedal for blues, provided you like a slightly fuzzier, heavier tone. All in all, a great pedal that’s sure to please if you’re looking for something that can handle rock and more, all with a convenient multi-channel feature for gigging. 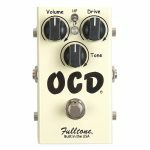 Known as the Obsessive Compulsive Drive pedal, or “OCD” for short, this overdrive pedal from Fulltone is a great choice if you like to play classic rock, hard rock, blues or grunge-inspired 90s rock. Designed for an 18v power supply, the OCD provides a smooth but crunchy overdrive sound. It has three controls — one for volume, one for drive and one for tone — with separate low and high pass filters designed to cut out unwanted highs or lows. While the OCD won’t quite do metal, it’s more than powerful enough for most 70s, 80s and 90s rock. It’s also solidly built, with outstanding construction and a durability level that guarantees it will serve you well as part of your gigging pedalboard. Like most US-made pedals, the Fulltone OCD isn’t cheap. However, its combination of classic tone, great durability and useful features make it a great premium overdrive pedal, especially if you’re a fan of classic rock. With its polished metal construction and album cover-style logo, the Biyang Metal-End screams “metal” in every way. It also screams metal once you switch it on, with one of the crunchiest and heaviest metal distortion tones of any pedal we’ve reviewed. You’ll find a plethora of control options on the front of the Metal-End. There’s the usual low, mid frequencies, middle and high controls, as well as an overall level control. There’s also the usual distortion control, which you can find in the upper-right corner of the pedal. There’s an amp simulator, complete with modern, normal and classic options. There’s even an optional high cut switch, letting you control buzzing. Add control options for a normal, bright or warm tone into the equation and the Metal-End over-delivers when it comes to features. 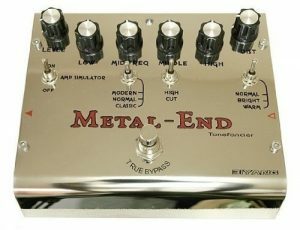 From a tone perspective, the Metal-End is as heavy as it gets. 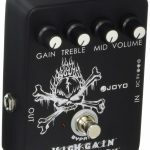 This pedal works for everything from 80s hair metal to thrash, death and speed metal, making it one of the most versatile metal distortion pedals available. 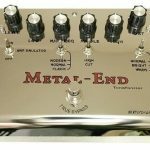 If you’re looking for an alternative to the BOSS MT-2, the Metal-End is a great option. It’s also fairly affordable, packing all of its control options and features into a sub-$100 price that earns an excellent score for value for money. Designed with hard rock and heavy metal in mind, the Pro Co RAT2 is another distortion pedal that’s ideal for metalheads. The RAT2 has a simple design, with controls for distortion, volume and a filter knob that allows you to cut out much of the buzz. It’s not the cheapest pedal on the market, but it still sells for an affordable retail price that even beginners should be able to afford. 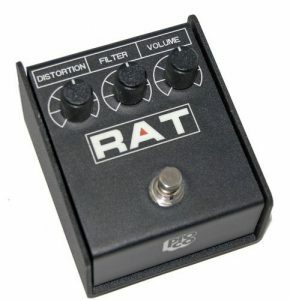 From a tone standpoint, the RAT2 is a great option for everything from hard rock to metal. Turn the distortion down and it works well as a 70s-inspired rock pedal. Turn the distortion up and it’s more than powerful enough for everything from 80s thrash to modern death metal. In short, this is a pedal that delivers a lot of power at a fantastic price. If you’re a metal guitarist looking for something that will do everything from Metallica to Cannibal Corpse, Dimmu Borgir and more, the RAT2 is a great choice. 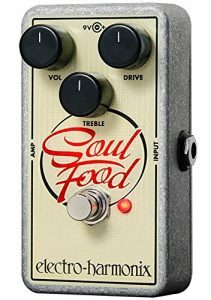 With its classic styling and boosted power rails, the Electro-Harmonix Soul Food is one of the best mid-priced distortion, fuzz and overdrive pedals on the market. Before we get into the specifics on this pedal, it’s important to point out that this is more of an overdrive pedal than a distortion stompbox. If you’re looking for a super crunchy sound, you’ll probably be disappointed. If you’re looking for a gain-heavy, fuzzy overdrive, you’ll love this. Unlike many other distortion pedals, the Soul Food prioritizes simplicity over complexity. 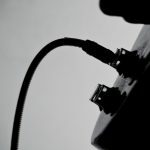 There are three controls — one for volume, another for drive and another for adjusting the amount of treble in your tone. 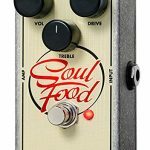 While serious hard rock and metal enthusiasts might feel let down by the level of distortion on offer, if you’re a rock, jazz or blues guitarist, you’ll find lots to like about the Electro-Harmonix Soul Food distortion pedal. 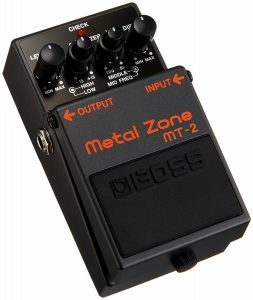 One of the most famous distortion pedals in the world, the Boss MT-2 Metal Zone is an excellent addition to your pedalboard if you’re a serious metalhead. If you like a strong, heavily distorted sound, the MT-2 is a great choice. Designed to cover every metal subgenre from classic 80s-style heavy metal to thrash, death metal and more, the MT-2 is a powerful distortion pedal that can add a huge amount of presence to your tone. The MT-2 includes four different tone controls, allowing you to adjust your highs, lows, mids and mid frequencies. There’s also a distortion control and a level control, letting you tweak your tone and volume on the fly. Most guitarists will find the mid and mid frequency controls the most useful, as a single turn of these knobs can transform your sound from a crunch, Megadeth/Metallica sound to something more like what you’d hear on a classic NWOBHM album. From a build quality perspective, the MT-2 is a very solid pedal. It’s more than strong enough to tolerate being stomped on during a live show, with a durable feel that makes it a reliable addition to any pedalboard. 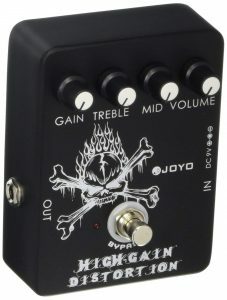 Designed for hard rock and metal, the Joyo JF-04 is a budget distortion pedal that packs a ton of punch into a compact design. The JF-04 has a plastic exterior with a small but user-friendly design. You can find the standard gain, treble, mid and volume controls at the top of the pedal, with a sturdy footswitch to control the distortion. Like most other distortion pedals, the JF-04 runs on one 9v battery. It’s also available with an optional DC power adapter for use at home or in the studio. Overall, this pedal feels quite well made for its modest retail price. From a tone perspective, the JF-04 covers everything from 70s, 80s and 90s rock to metal. If you’re looking for the classic Mesa Boogie metal distortion tone, you’ll be happy with the way the JF-04 sounds. For hard rock and metal guitarists on a budget, the JF-04 is hard to beat. Just be aware that its all-plastic construction might limit its durability as a long-term gigging pedal. Another budget distortion pedal, the Donner Morpher provides a crunchy sound that’s suitable for everything from rock to metal. Like the Joyo JF-04, this is a compact pedal that will fit on even the smallest of boards. It has gain, tone and level controls, with a switch allowing you to change from a natural tone to tight and classic distortion sounds. Unlike most budget distortion pedals, the Donner Morpher is made from aluminium alloy, with excellent durability and built quality. Tone-wise, the Morpher does everything from hard rock to metal well, although it’s better suited to 80s metal than thrash or death metal. All in all, if you’re looking for a budget distortion pedal that works well for classic rock, 70s/80s metal and modern rock alike, the Donner Morpher has a lot going for it, especially at its great retail price. 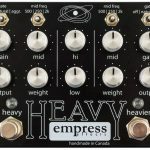 Designed specifically for metal and packed with features, the Empress Effects Heavy is one of the most impressive distortion pedals on the market. 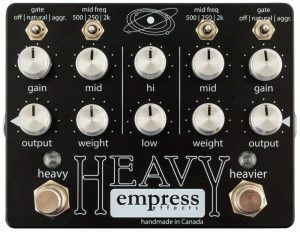 As you’d expect from a pedal named the “Heavy,” this pedal is designed with heavy distortion and high gain in mind. It has two channels, “heavy” and “heavier,” both of which include their own independent gain, mid, output and weight controls. There are also shared high and low controls, letting you further shape your tone to your exact needs. Each channel even has its own separate mid frequency switch, as well as noise gates designed to keep buzz and other noise out of your signal chain. In short, the Heavy is packed with features. It’s also highly durable, with some of the best build quality of any pedal we’ve seen. This makes it a great piece of kit but also an expensive pedal, with a retail price that puts it out of reach of most beginner and budget-conscious guitarists. The Heavy does everything you’d expect it to, offering great tones for timeless 70s/80s metal, thrash, death metal and more. Simply put, if you’re looking for the ultimate distortion pedal for metal and don’t mind a higher-than-average price, this is what you’re looking for. Chinese manufacturer Rowin has made a name for itself as one of the best budget mini-pedal brands, and the Analog Heavy Metal Distortion shows why. Available for a fraction as much as many other distortion pedals, this pedal delivers a crunchy tone that’s great for metal. Like most mini distortion pedals, this pedal is fairly light on features. There are distortion, tone and volume controls on the front, with an optional high or low boost feature (you can also turn the boost completely off). In terms of tone, this pedal is fairly heavy. 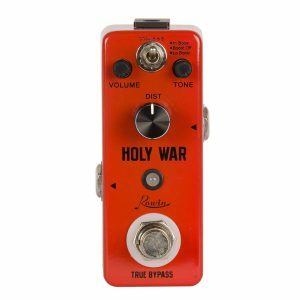 Turn the distortion halfway up and it works well as a hard rock pedal; crank it all the way up and it provides a good metal tone that’s usable for 70s and 80s metal, thrash and more. All in all, this is a great pedal for the price. While it isn’t built to quite the same standards as the pedals you can buy from Boss or Electro-Harmonix, this tiny stompbox delivers a great range of tones at a budget-friendly price. 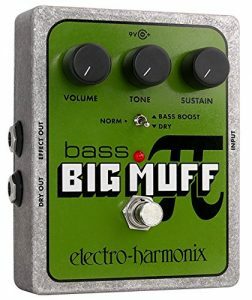 The only bass distortion pedal on our list, the Electro-Harmonix Bass Big Muff has a smooth and pleasing distortion tone that adds a lot of presence to your sound, making it great for everything from basslines to solos. The Bass Big Muff includes three control options, letting you adjust the volume, tone and sustain to your needs. There’s also a “dry” and “bass boost” toggle switch that lets you mix the distortion with a cleaner signal for a dryer, more defined sound. You’ll find two outputs on the Big Muff — one for a dry signal and another for the distorted signal, which make this a great pedal for the studio. 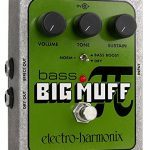 All in all, the Bass Big Muff is an excellent pedal for bassists looking for smooth, ear-pleasing distortion. Designed specifically for hard rock and metal, the Boss MD-2 delivers a powerful, crunchy tone that makes it a must-have for many guitarists. 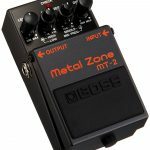 Compared to the MT-2 Metal Zone, the MD-2 has a more versatile sound. Turn the distortion a quarter of the way around and you’ll get a twangy, somewhat fuzzy tone that’s ideal for classic rock. Turn it further and you’ll pass through hard rock all the way to a crunchy metal tone. The MD-2 also has control options for tone, including a bottom control, levels and a gain boost control, letting you increase the gain for solos. 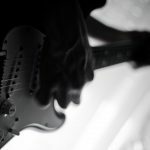 The bottom control is one of the handiest of the three, especially if you play downtuned or use a seven-string guitar. As you’d expect from Boss, this pedal looks and feels solid. It’s made entirely from metal, with an excellent build quality that makes it a reliable addition to your pedal board for the studio or the stage. 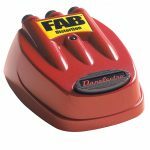 Small, simple and affordable, the Danelectro D-1 FAB distortion pedal is a compact pedal that delivers a good tone. This is a tiny pedal, with a unique design that lets it fit into any corner of your pedalboard or slip into the front pocket of your guitar case. While the tone provided by the D-1 FAB isn’t the greatest in the world, it’s enough for classic rock, hard rock and more. At a low distortion setting, the tone is fuzzy; crank up the distortion and the D-1 FAB takes on a crunchier, heavier sound. As you’d expect from its design, the D-1 FAB is made of plastic. 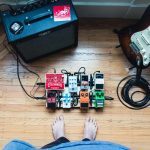 While it isn’t exactly a highly durable pedal, it’s more than strong enough to withstand regular use in the studio, as well as light gigging. 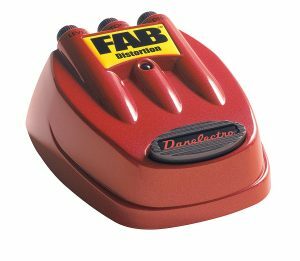 Overall, the D-1 FAB is a good budget distortion pedal that delivers usable tones, albeit with some minor weaknesses. If you’re looking for something light, portable and affordable that’s small enough to store almost anywhere, the D-1 FAB is a good option. 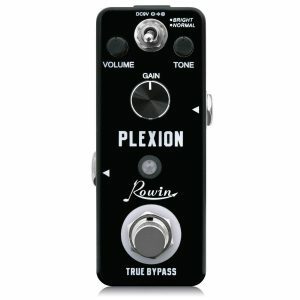 Another affordable mini-pedal from Rowin, the Plexion covers everything from classic rock to 80s, 90s and early 2000s hard rock. Like other Rowin mini-pedals, this distortion pedal has a simple design. You’ll find the usual volume, tone and gain controls on the front of the pedal, along with a switch allowing you to switch from a normal, untouched sound to a brighter tone. Rowin have designed the Plexion to mirror the sound of the original Plexi amps. While you’ll struggle to get a crunchy, metal tone from this pedal, the Plexion sounds great when used for classic rock, hard work and even 80s hair metal. As you’d expect from Rowin, the value for money offered by the Plexion is great. All in all, if you’re looking for an affordable, simple and effective distortion pedal for hard rock, you’ll find lots to like about the Plexion. The right distortion pedal can add a have amount of power to your sound, giving you the crunch you need for rhythm guitar and the presence you need to stand out from the rest of the band for solos. Want to get more from your distortion pedal? 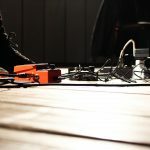 Pair it with any of the pedals in our guide to the 15 best wah-wah pedals to create your own unique lead and solo tone. Our overall winner is the brilliant Boss DS-1!